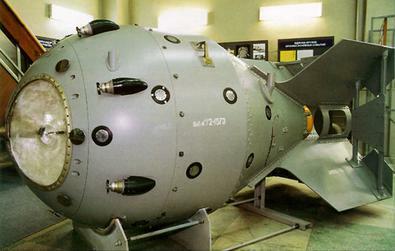 The RDS-1, also known as Izdeliye 501 and First Lightning, was the nuclear bomb used in the Soviet Union’s first nuclear weapon test. The United States assigned it the code-name Joe-1, in reference to Joseph Stalin. It was detonated on 29 August 1949 at 7:00 a.m., at Semipalatinsk, Kazakh SSR, after top-secret research and development as part of the Soviet atomic bomb project.